organizations, he also plays a pivotal role in providing strategic vision as Vice Chairman of the Board Of ICI Pakistan Limited. 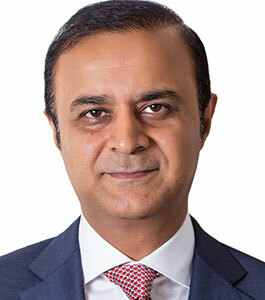 He started his career With Yunus Brothers Group (YBG) - a family conglomerate in 1991. YBG is one of the premier business houses in Pakistan With diversified interests in Cement, Chemicals, Energy, Textiles, Automobile Assembly and Real Estate Development. Mr. Tabba serves on the Board Of Trade Development Authority of Pakistan (TDAP) — a global trade development arm Of Pakistan's Ministry of Commerce. He the former chairman Of All Pakistan Cement Manufacturing Association (APCMA), a regulatory body of cement manufacturers in Pakistan. He has been appointed by the Government of Pakistan to serve on the Board Of Directors Of Pakistan International Airlines Limited. Mr. Tabba is a Trustee of the Fellowship Fund for Pakistan (FFFP) which sends a top Pakistani Scholar every year to Woodrow Wilson International Center for Scholars, a think tank based in Washington D.C. and a leading institution for in-depth research and dialogue to inform actionable ideas on global issues. Additionally, Mr. Tabba is the Chairman of Pakistan Business Council (PBCJ, a business advocacy forum comprising of leading private sector businesses. He has been nominated as member of Pakistan - India Joint Business council (PIJBC) which promotes trade between the two countries. In recognition Of his outstanding services and contributions in the social development sector of Pakistan, World Economic Forum (WEF) in 2010 bestowed on Mr. Tabba the title of Young Global Leader YGL). Board of Governors at numerous renowned universities, Institutions and Foundations. He is the Vice Chairman Of a not-for. Profit organization, Aziz Tabba Foundation. The foundation is working extensively in the field of social welfare, education, health and housing. The Foundation runs two state-Of- the-art hospitals in Karachi; 170 bed Tabba Heart Institute (THI) which is a dedicated cardiac care hospital and 100 bed Tabba Kidney Institute (TKI), a specialized institution providing comprehensive treatment for Nephro—urological disorder.